2. Shows religious language is not absurd and can provide some understanding of God. 4. Hick argues that enables to make statements yet still preseve the mysterious element to the Judaeo-Christian God. 1. If we say John is bad is that also a refection of God’s attribute? 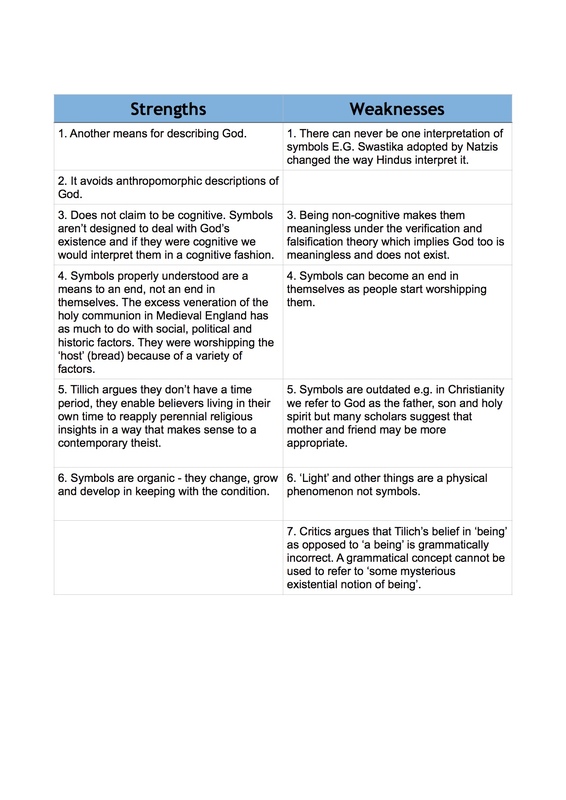 How do we know which analogies are appropriate to God. 2. Duns Scotus argues that it is vague and leaves us unable to understand God and his actions. 3. Assumes similarity between humans and God which is difficult to accept if God is an external being which is completely different to humans. 4. In respect to the analogy of proportion, is it really possible to make comparisons between necessary and contingent beings, its like comparing apples and pears. 5. Why bother with religious language if God is mysterious? It is far too neat – is the believer just trying to have his cake and eat it. 6. Patrick Sherry points out the believers usually use religious claims literally not analogically. Tillich was an American-German theologian and Christian and probably contributed the most to the debate of the role of symbols and symbolic language within religion. Tillich said the God was not necessary or contingent, was not ‘a being’ at all but rather God is being and he prefers to call God the ‘Ground of the Being’. Then he asserts that religious allows us to express our ‘ultimate concerns’ which leads us to awakening of a new true reality. For this reason he argues that only symbolic language and symbols can do the Ground of the Being justice and is a credible alternative to analogy. Symbols unlike signs, he points out, communicates a deeper meaning, emotion and beliefs and thus are crucial to religion. In summary, he believes religious language is non-cognitive and symbolic and symbols are the best way to communicate meaning in religious talk. i. ‘Being’ is a grammatical concept so how can we apply it to a mysterious and transcendent being. ii. Symbols have many interpretations and how can this be if they have such a deep and powerful message? iii. If they are more effective then words then why do they become outdated e.g. the Virginal Conception of Jesus is no longer popular among the protestant denominations. iv. Tillich’s view can be seen as vague and this have provoked thinkers such as J.H.Randall to argue that religious language is like art doesn’t tell us anything about reality but rather about human experience and condition. v. If they are not literally true then what meaning could they possible have? Furthermore, if the resurrection is interpreted as symbolic then Christianity and its foundations appear to dissipate. Wittgenstein is probably the most influential and famous philosophers of the 20th century. He was an Austrian and went to school with Hitler. Through inquiry and persistent ended up studying in Cambridge under Bertrand Russell. He life and most importantly work can be split into two phases. It was Wittgenstein’s first book the Tractatus that influenced the logical positivists. He put forward a picture theory of language which was very simple. The theory stated a statement is only meaningful given that it can be defined or pictured in the real world. He concluded his book arguing the ‘Whereof one cannot speak, one must remain silent’. Wittgenstein begins by establishing that religious language is not meaningless but rather non-sensical by this he means that because it is difficult to define or picture it, it does not make sense to discuss it – remember ‘Whereof one cannot speak, one must remain silent’. He then observes that actually metaphysical claims use the same ordinary language but in a ‘odd way’. He said confusion on the meaningful/less- ness of religious language only arises because of a confusing when ‘language goes on holiday’. To understand this he formulates this theory of Language Games which asks us to have another closer look at how the language is used. We can use language meaningfully without adhering to any empirical criteria (verification principle) because the true meaning of language is in how we use it. To use this he introduces us to the concept of forms of life. He said just like we have different sports and each sport has its own rules and language uses so does each form of life. We cannot apply the rules of rugby to basketball, that would be absurd. The same way we cannot apply rules and the beliefs of scientific language to religious language. They are two different things, it is like comparing apples with pears. For believes miracles, the Bible etc are all sufficient evidence for the claims they are making so trying to apply a scientific criteria does not make sense. – Wittgenstein’s work falls into the trap of Fideism. This is the belief that religion cannot be proven by reason implying it does not have rational foundation and ultimately it is the product of human imagination. – Wittgenstein may be disproving of certain thing maybe for instance fgm practises then this implies that there is hierarchy of language games to which some are better then other. This gives the opportunity for logical positivists to put science before religion. – One cannot assert religious claims such as God exists because these a simply claims which have no external rationality and only make sense to the believer. Keith Ward, uses examples such as God is Three to point out that actually religious claims are the same as anything else making the same point as the big bang created the world hence the theory of language games does not works. Flew pointed out that Hick’s idea of religious bliks cannot be true since a blik is not assertion it is a way of perceiving the world and religious claims are assertions as opposed to a perception. Flew was influenced by Karl Popper’s distinction between scientific and non-scientific ideas. Popper pointed out that as theories were tested and falsified they were eventually suspended and taken over by new theories e.g. Einstein if you like updated Newton’s work. Flew pointed out that similarly religious claims are ones that can be made false by science and hence are meaningless (Flew does not call them meaningless but other scholars interpret his work like this). He used John Wisdom’s parable of the gardener to explain why religious believers will not accept it. Furthermore, Flew adds to the debate by suggesting that God ‘dies a thousand qualifications’ and by this he means that like in the parable of the invisible claims when religious claims are questioned they are watered down so much that the claim just becomes nothing but an expression like ‘ah’. – RM Hare disagreed by saying actually religious believes are simply bliks and uses the parable of the lunatic to explain this. – We can also use Hick’s eschatological argument to suggest that the only credible way to falsify religious claims is after death hence they are still meaningful. A J Ayer addressed the problems that logical positivists at the Vienna circle faced and formulated the weak verification principle. Ayer suggested that actually if in theory we can synthetically, analytically or deductively verify a claim then it meaningful and because one cannot with religious language it is meaningless. Furthermore, they are not ‘significant propositions’ because they can’t be proven to the non-believer and falsified to the believer. – John Hick presents an eschatological verification method. – If historic claims are verifiable in theory then so are claims about Jesus. – Given that the verification principle cannot verify itself Ayer argues that actually the principle can only be used for statements or claims not whole theories – but isn’t religion a theory? Isn’t ‘religious language is meaningless’ a claim? The Vienna Circle is a group of philosopher in the early 20th contrary who put together the verification principle (strong). The said that unless a statement is analytically, synthetically or deductively true it is meanings and hence religious language is meaningless. Ends with a quote from Rowan Williams. Religious Language = Specialist religious vocabulary as well as religious, moral and ethical claims. What are the uses and purposes of religious language? Religious Language has three functions. To Expressive: They are used to express feelings and emotions. Peter Donovan argues that religion encourages to discipline their emotions in the right direction e.g. forgive wrong-doers. To Performative: To perform an event e.g. a wedding. To Prescribe: To encourage or prevent people from acting in a certain way. Difficult to describe something so out of this world and immaterial. Is humanizing an effective mechanism of describing something immaterial. Language is sometimes used univocally. (This means the words used to describe God mean exactly the same as when words are used to describe humans). However, is it fair to say that when we call God faithful we mean the same as when we call a dog faithful? If on the other hand we use words equivocally – this means that a word used to describe God does not mean the same as if it was used to describe a human. However, then can we ever know the meaning of a word? The last problem which this whole unit is about is the meaningless/meaningfulness of religious statements. Religious believers claim that religious language is cognitive i.e. it can be verified or falsified but other philosopher dismiss religion on the basis that it is non-cognitive i.e. you cannot verify or falsify it.